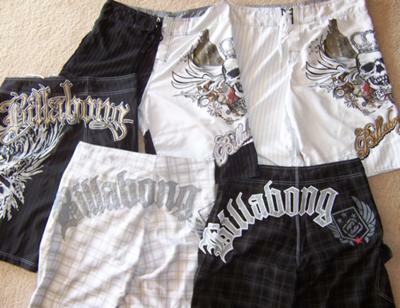 If you like your Billabong shorts or shirts you will find plenty to choose from in the markets in Patong. We purchased these Billabong shorts from the Patong Otop markets located behind the Holiday Inn on the southern end of Patong Beach. Most of the store holders are Thai's compared to some of the markets that are under tarpoline's at Karon and Kata beach. Before you buy check the quality of the stitching, we were happy to pay 400 baht each for good quality shorts and you can feel the difference to the cheaper shorts. You will find the cheaper shorts available everywhere, between 250 to 300 baht, although we found they don't last as long. You need to search to find the better quality shorts. When you go to the markets remember to smile and have fun haggling, lets be honest 50 or 100 baht is not a lot of money for most travelers. Treat the stall holder with respect when haggling out the price, they are just trying to make a living, sometimes I get embarrassed the way that some shoppers carry on just to save 50 baht. Have a great time finding those bargains.